The story might be classic and eternal, but it’s always fresh—especially with a cast like this one. As Mimì and Rodolfo, Licia Albanese and Giuseppe Di Stefano will make you feel like you’re falling in love for the very first time. The headiness of the first meeting, the almost unbearable pain of parting, the poignancy of reconciliation—it’s all conveyed with a vividness that will thrill and then break your heart. 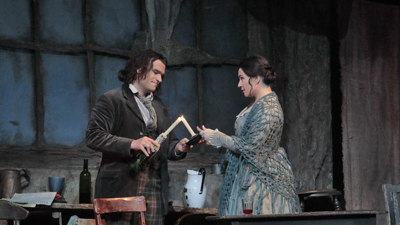 Hilde Gueden sparkles as the tempestuous Musetta, who sets her cap for Frank Guarrera (Marcello). The great Cesare Siepi is Colline.